That's what this thread gonna be about. Post here when you find examples of it. In the past week, we have seen two people killed by suspects fleeing from the police in their car. In both instances, the perp is a black male and the victim is white. We also documented three cases from late 2014. In each case the perp is black and the victim is white. 4/11/15 – Aaron Jerome Davis was killed when a black male hit him with his car in St. Petersburg, Florida. The suspect was drunk and fleeing from police. Another victim was injured. 4/10/15 – Matthew John Smith, 31, was killed when a black male wrecked his car into him in Lakeland, FL. The suspect was fleeing from police in a stolen car after committing a series of other crimes. 11/25/14 – Stephen M. Fox, 58, was killed when a black male hiy him with his car in Dallas, TX. Two other people were injured. The perp was fleeing from police. 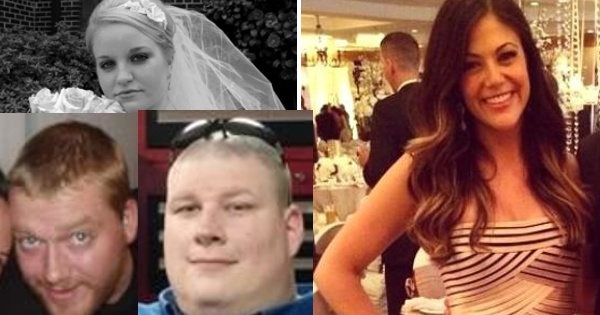 10/5/14 – Fransesca Vitale Weatherhead, 25, was killed when a black male slammed into her car in Redford Township, MI. The perp is a career criminal who was fleeing from police. 9/4/14 – Heather Cater, 22, was killed in Little Rock Arkansas, when her car was hit by a black male fleeing from police. A handcuffed white female was nearly killed when a Bay Area Rapid Transit office slammed her face into the concrete. She was drunk on St. Patrick’s Day in 2014. Police station photos show that the officer towered over the small, skinny woman. 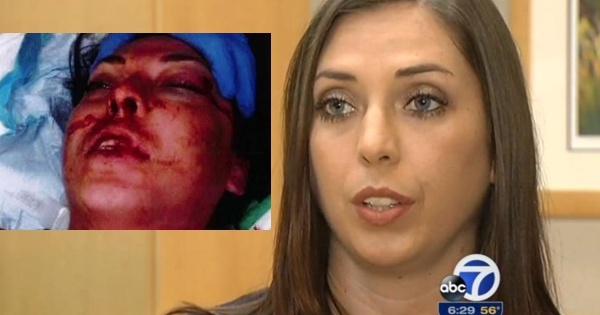 She suffered four facial fractures, broken teeth, and was knocked unconscious. Her face was literally pulverized. Photos shows a large amount of blood all over the police station floor. The victim of the beating works as a model and a bartender. The case is only in the news now, because the victim filed a lawsuit against BART and the Oakland Police Department. It was picked up from a local media outlet by the UK Mail Online and the website of the New York Daily News. If the woman had been black, this would have been the biggest news story in America for two months! Instead, it was a blip in the local news. Bahar Mustafa, recently made an open declaration of racial and gender warfare against whites and males at Goldsmiths University in London. She read the declaration in a room full of minority women. Her insane rhetoric is made more comical by the fact that she the Student Union’s “Welfare and Diversity” officer. 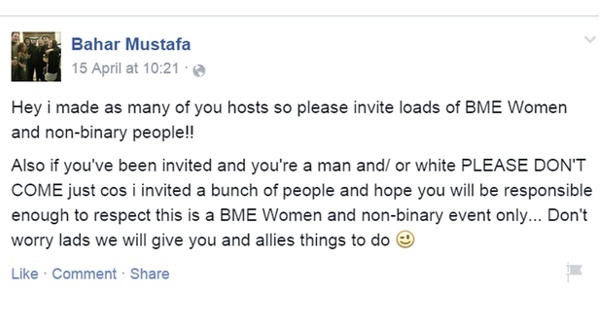 Mustafa claims that only white males can be racist. She says that non-whites can not be racist and women can not be sexist. She explicitly banned all whites and all males from attending her declaration of war. I want to explain why this is false. I, an ethnic minority woman, cannot be racist or sexist towards white men, because racism and sexism describes structures of privilege based on race and gender. And therefore women of colour and minority genders cannot be racist or sexist because we do not stand to benefit from such a system. In order for our actions to be deemed racist or sexist, the current system would have to be one that enables only people of colour and women to benefit economically and socially on such a large scale and to the systematic exclusion of white people and men, who for the past 400 years would have to have been subjected to block colonisation. We do not live in such a system, we do not know of such a history, reverse racism and reverse sexism are not real. We will not be silenced; we are militant. The world is not ready for minorities to challenge the status quo, but resistance to our resistance is futile. Saint T. Thomas Jr., Mayor of Union Springs, AL has ordered the removal of decorations from grave-sites of Confederate soldiers. The move is motivated by racial hatred. Black power activists feel there are getting back at white people by desecrating the graves of Confederate soldiers. Union Springs is has about 3,980 people and is 75% black. Thomas has been a failure as mayor and his attack on Confederate graves provides a way to distract the public from his incompetence. Last week a black attorney, Myron Penn, was caught vandalizing a historic cemetery by ripping Confederate decorations out of the ground. Instead of being charged with vandalism and desecration, he was praised by radical left-wing media outlets. The decorations were immediately replaced by good Samaritans. This prompted Thomas to enter the fray and issue an executive order demanding the permanent removal of the decorations. City workers are expected to tear up the new decorations in the near future. 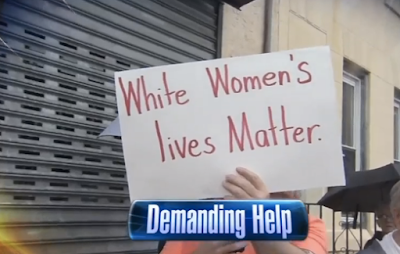 Thomas has close ties to the NAACP, a group that routinely espousal anti-white hatred. The NAACP have protested Confederate symbols in Cemeteries and Museums in numerous states. In South Carolina, the NAACP has even denounced a statue of George Washington on the statehouse grounds. The McKinney Pool Party story by the media was a total hoax. It was not even a “pool party.” A cookout was held at a park near the pool. 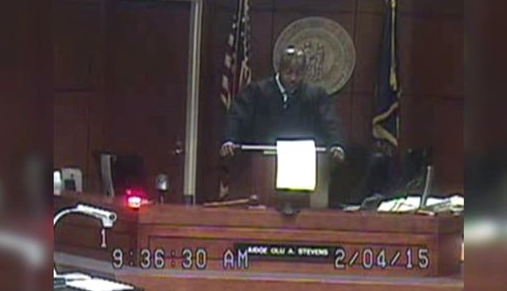 A DJ was hired, who blasted foul mouthed gangster rap music for hours. The party was promoted on twitter and other social media. This prompted carloads of teenagers from other neighborhoods began showing up. Once the crowd reached about one hundred teens, they violently invaded a private community pool. The mob of teenagers both fought with each other, hurled bottles at cars, assaulted the two neighborhood security guards, and viciously attacked an adult female resident. As the violence escalated, residents began calling the police. Virtually everything reported by the national media has turned out to be a hoax. The media has falsely claimed that white police officers attacked a peaceful black pool party, because residents merely objected to the presence of black people in their neighborhood. The pool has strict rules. Any “pool party” requires prior notification, a deposit, and must be limited to no more than twenty people. Click below to read a detailed analysis of what really happened.